Mayan clothing still has a lasting tradition in the Yucatan Peninsula, and today it is used in all parts of Mexico and around the world by people who fall in love with the designs of this wonderful culture. Today contemporary Mayans keep their long tradition making beautiful textiles offering to the world a piece of their culture. 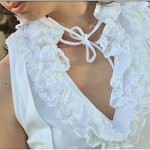 We are pleased to give you a taste of women's Mayan contemporary clothing style or you can also visit our page on Mexican Guayaberas. 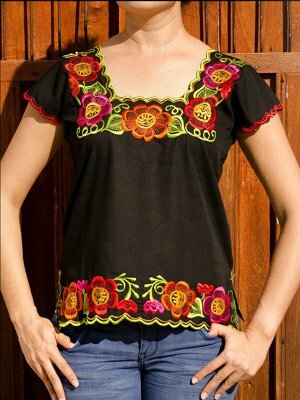 This beautiful Mayan Blouse has hand embroidered flowers around the square neck which makes it uniquely Mayan. The same flower design at the bottom make it look really nice. Check other Mexican blouses here. 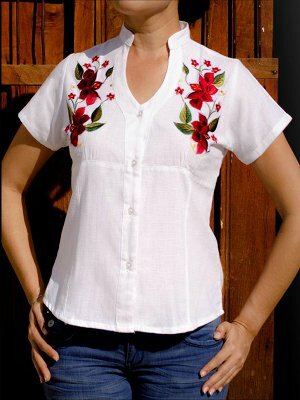 This Yucatecan blouse is the women's guayabera style with colorful hand embroidered flowers. This Mayan embroidered dress has a modern look with the same kind of design that makes it Mayan. Check other Mexican dresses here. This Mayan embroidered belt is used with a nice plain dress or blouse. It is perfect for a casual or formal occasion. Mayans have been spinning cotton and knitting their own clothing for centuries. After the Spanish colonization, Mayan women developed an organization based on collaboration and soon Mayan textiles were sold all over the New Spain. By the late XVI century infrastructure between major towns started to develop and the demand of textiles grew to the point that the region was recognized as a specialized cotton textile center. Mayan fabrics were of two kinds. One was fine linen to pay tribute, and the other one was commercial rougher fabric of less quality. A century after the Spanish arrived in America, by the late 1500's, the production of textiles declined mainly for two reasons. 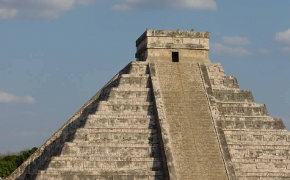 First because of the generalized pest, draught and hunger that reduced the Mayan population by 50%, and second because of the tributary changes made by the governor of the New Spain by the end of the century. Traditionally, Mayans dressed according to their daily routine and their level in society. Most women dressed with a kub or huipil as it is known today, and a long skirt, and men dressed with a kind of shorts called patí. Nobility used more sophisticated attire embroidered with feathers and gems, wore leather sandals, collars, and heavy belts with inlayed stones. They also used plumes, long and short capes, ornaments made with snails, earmuffs, and rings among other things. 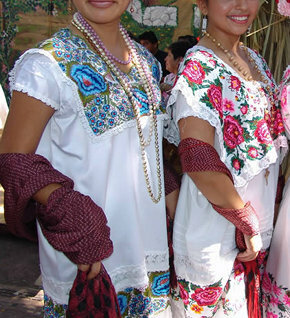 The typical Mayan clothing attire for women is called terno. The terno has three pieces: jubón, huipil and fustán. The first one is a square piece approximately 15 inches wide with a hole in the middle for the head, and is placed on top of the huipil or blouse. The fustán is a long skirt that lies 4 finger from the ankle. The jubón and fustán are nicely embroidered with colorful tropical flowers designs: garlands, violets, roses, carnations, etc. Mayan clothing has a unique, colorful and beautiful design with a long and rich tradition. You can complement your Mayan attire with a rebozo from the town of Santa Maria del Rio in the state of San Luis Potosi. For men's Mayan and Yucatecan style clothing, please visit Mexican Guayaberas.